The high custom duties have adversely impacted the costs of products in India and contradict the government’s efforts to provide low-cost healthcare available to masses. The government has taken several measures to curb the cost of healthcare and realise its vision of making healthcare accessible. However, measures like imposition of un-nuanced price control on a number of drugs and medical equipment like stents and knee implants have attempted to reduce cost without ensuring the industry viability. 2017 witnessed the launch of the world’s largest universal health care scheme, the Ayushman Bharat-Pradhan Mantri Jan Aarogya Yojana (PMJAY), a path-breaking programme to enable healthcare access to the un-served and under-served. While one year is too short a time to adequately gauge the success of a healthcare programme of this magnitude, the hospital admission figures of more than 9.26 lakh patients under the scheme in such a limited time-span appear to show that the government is on the right path to achieve its goals. On one hand, with healthcare schemes like PMJAY, the government aims to increase healthcare affordability and accessibility, on the other, several issues such as high custom duties exist that have prevented cost reduction of critical care equipment and devices by global companies. India has one of the highest customs duties on medical devices in South Asia, as depicted in the table below. The high custom duties have adversely impacted the costs of products in India and contradict the government’s efforts to provide low-cost healthcare available to masses. With other South Asian countries having a zero customs duty regime, there is also a threat of smuggling of low-bulk-high-value devices into India. The result will not only be loss of revenue for the government but would expose patients to products which are not backed by adequate legal and service guarantees. Another point to note is that in segments like consumables, where China has near self-sufficiency, in 2017 it reduced customs duties from 4 per cent to 3.3 per cent for several products to avoid the problem of smuggling and to inject competition in the sector. While China is self-sufficient in consumables, India is far from that achievement, as can be well confirmed through a third party survey. 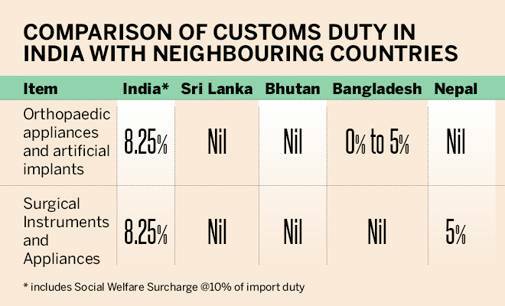 Amid pressure from some quarters to increase customs duties even higher, the government should consider a cost-benefit analysis of such demands before taking any decision. It should also evaluate the ability of those who propose so to fill in the critical gaps which may get created if their recommendations are implemented. Ideally, the customs duties should be cut to 2.5 per cent, including all surcharges, to enable the industry to enhance accessibility of healthcare to the un-served and under-served while also warding of the threat of smuggling low quality devices into India. Considering that 70 per cent of the devices are currently imported in the country, reduction of custom duty would be a welcome relief for the industry as well as the patients. Another area that needs urgent attention is the distortion in customs duties on spare parts. Custom duty on spare parts of the medical equipment are currently charged at a higher rate than the equipment itself. For example, Heart Lung Machine attracts basic custom duty of 7.5 per cent and GST of 12 per cent, whereas its spare parts like Roller Pump attracts basic customs duty of 10 per cent and GST of 18 per cent. Similarly, GST on Contact Lenses is 12 per cent, whereas the Contact Lens Solution, which is the essential part of using Contact Lenses attract 18 per cent GST. The inverted duty structure is counter-productive and the government should charge same customs duty and GST on spare parts and medical equipment, at the least. The government launched ‘Make in India’ to promote indigenous innovation. However, research and development in medical technology space has not been adequately encouraged. A tax holiday should be provided to medical device R&D centres under the Transfer Pricing Act to boost investment in setting up in-house R&D capabilities. Tax incentives can also be given to the industry for developing global patents from India. Currently, there are no tax benefits on export income. Export being a growth engine for the economy, it is important that efforts should be made to make it competitive in the international market. India’s export performance in the last 2-3 years has been on a decline which impacts the balance of trade. Introduction of export incentives related to direct tax exemption for the export profits would attract more investments to medical devices sector. The high rate of Minimum Alternate Tax (MAT) has cast substantial burden on companies which are already affected by various external factors. Conceptually, MAT is a minimum and an alternate tax and hence it should not be at a rate which is more than 50 per cent of the basic corporate tax rate. The government should reduce MAT rate to 15 per cent from the present effective rate of 21.34 per cent, including surcharge and education Cess. GST should not be charged on trials and samples as doctors need samples, free trials and demos in order to satisfy themselves on the efficacy and safety of the product. Healthcare services are currently exempted from GST which makes it impossible for hospitals to claim credit for GST paid on inputs. This results in higher cost of treatment for the patient. Once zero rated, hospitals will be able to avail GST credit on inputs, leading to lower healthcare services cost. The above suggestions are in sync with the government’s objective of increasing accessibility to affordable healthcare in the country. By now the finance ministry would be having a final look at the suggestions and the medical technology industry hopes that the various lacunae in tax and duty structure will be addressed for a lasting solution.